← Organic – What’s that REALLY Mean? Watch out parents, this one is going to hurt. But don’t worry, just know I’ve made countless mistakes myself, and continue to learn also. 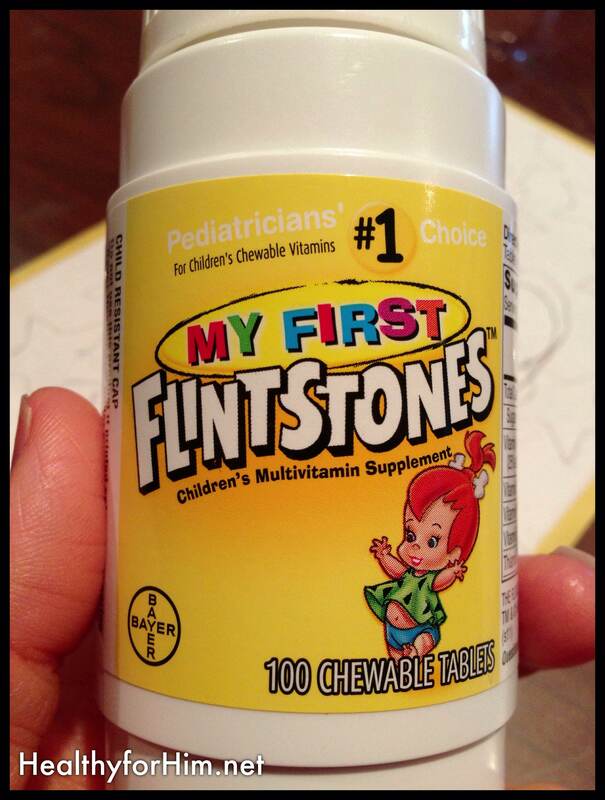 Like the Flintstone vitamins I thought were SO good for my kids? (ack!) Now we do Juice Plus and Animal Parade brands. Over the course of this transition and these changes, that started just with me… I’ve observed something keenly interesting. Often times, we, as parents, will work hard to get into shape, or lose weight or maintain health. WE start paying closer attention to what they’re putting our body because we know it’s affecting us. Is it nourishing for me? Is it building my immune system, or feeding disease? Is this FAT the right kind to feed my brain? Meanwhile, who is being left behind? You guessed it, often times… The kids! Our children are only products of what we place before them to eat. If we buy them junk – they’ll eat it. They NEED trained to know what and why food is good or bad for you so in the future they can make educated decisions too. They are forming habits that will stick with them into adulthood, and when they will also be parents. So why is it, that we think things that aren’t good for “us” … are “ok” for them to consume? Is it because they’re young? Do we think their tiny guts who are already (most likely) damaged from vaccinations and other increased toxins, can tolerate more?? Maybe you haven’t given it much thought at all. Each change has brought about its own set of challenges, that’s for sure. But I look back and see how God was preparing our lives for this point. Baby stepping us towards what the world would view as “drastic” changes for our health. No one wants their child to feel left out, or to feel like they’re living in a bubble. But the reality is, if you don’t have your health – it makes it difficult to function in life! We couldn’t go anywhere when we were sick all of time, and the long-term effects were adding up. My prayer is – is that soon this country will wake up to what is going on with our food supply and they will gradually demand something different – for the sake of our future generations. I know we are educating our kids, so they can be the voice of truth and share with other. We’ve made it part of our school learning – but there are so many ways to go about it. Allowing your kids to get hands on experience growing a garden, assist in grocery shopping, or meal planning and cooking in the kitchen are all great ways. We share documentaries and snippets on health with the kids too, so they get in on the learning as well. Reprioritizing your life might just be what God is ordering. It certainly has taught us what is important in life – and encouraged us to SLOW DOWN, and let go of stress in a big way. Life on earth is short, take care of what God has given you. Including teaching your kids to be healthy for Him. No need to worry – God told us not to. Just obey and He provides what we need. Yikes huh? Sugar, sugar, and more sugar. Artificial colors galore, corn and soy. At the very end is the vitamins… I guess when they say “A spoonful of sugar helps the medicine go down!” They weren’t lying! For life is more than food, and the body more than clothes. Consider the ravens: They do not sow or reap, they have no storeroom or barn; yet God feeds them. And how much more valuable you are than birds! Who of you by worrying can add a single hour to your life? 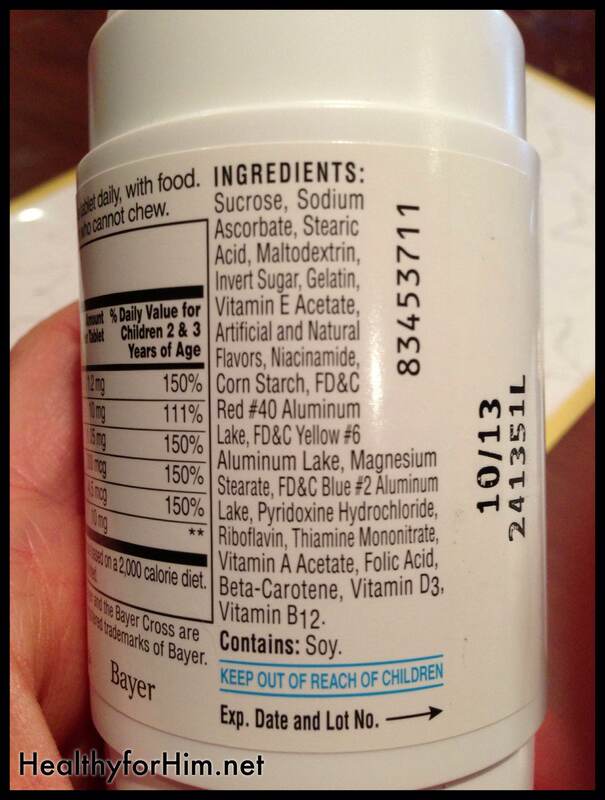 Posted on September 23, 2013, in Auto Immune Disease, Celiac/Gluten Sensitivity, Label Reading and tagged auto immune disease, behavior, celiac diease, Flintstone vitamins, food coloring, food coloring in vitamins, gluten intolerance, healthy for him. Bookmark the permalink. 4 Comments. When I read the title in my inbox I thought, “Ooooh, this is gonna hurt.” Then your first line confirmed it. Thanks for your compassion and gentle but firm push towards better health for whole families. Convicting, as always. EXCELLENT INFORMATION AS USUAL!!!!!!!! I’M SHARE YOUR INFORMATION WITH MY WORLD OF BLOGGERS ALSO!! !